The US Centers for Disease Control and Prevention describes CPE as “nightmare” bacteria. THOUSANDS OF PEOPLE who may have been exposed to an antibiotic resistant “superbug” during a hospital visit are being contacted to make them aware of the potential infection. 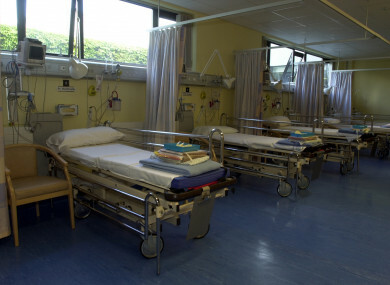 A number of different types of Carbapenemase-producing Enterobacteriaceae (CPE) have spread through the health system in Ireland in recent years. The bugs’ resistance to treatment has prompted the US Centers for Disease Control and Prevention to describe them as ”nightmare” bacteria. Last year saw a wave of fresh diagnoses in with 433 new people found to be carrying the infection. The HSE now believes, based on testing, that approximately 2,000 people in the country carry the disease. The majority of carriers contracted the infection during a hospital visit. The health service says that most patients who carry CPE never experience any illness, as the bug lies harmlessly in the gut. However, one in every 400 carriers goes on to develop a serious infection. “It is important to say that only a small number of the people who are CPE contacts will carry CPE,” Prof Martin Cormican, HSE Lead for Antimicrobial Resistance and Infection Control, said. For most of those patients who do carry CPE it will live harmlessly in the gut along with the many other gut bugs we all carry. However the information that they are CPE Contacts is important if they have to go back into hospital in the future. “It is important also to say that for those people who get CPE infection, there are antibiotics that work to treat CPE infection,” Prof Cormican added. Due to the potential threat of the bug, the National Public Health Emergency Team (NPHET) for CPE was set up in October last year. This expert group advised that any patient who shared a ward or clinical area with a CPE carrier should be contacted. Hospital groups are now getting in touch with these CPE ‘contacts’. They are not being recommended to have tests conducted rather they are being advised to follow good hand hygiene practice to prevent the spread of the bacteria. About one in every 20 people who are identified as contacts will go on to carry the bug. Anyone who is concerned about CPE can access information from the HSE here. Email “Hospitals are contacting thousands of patients to tell them they may have contracted a 'superbug'”. Feedback on “Hospitals are contacting thousands of patients to tell them they may have contracted a 'superbug'”.